Ultraviolet disinfection systems stop contamination and illness before microorganisms have a chance to reproduce. The Monozone™ Ultraviolet Air Ozone Generator will eradicate virtually all microorganisms it contacts as well as eliminate harsh, unwanted odors to give you a healthier space with the help of germicidal UV-C rays. How Does the Monozone™ Air Ozone Generator Make My Space Healthier and Eliminate Odors? Disinfection treatment of unoccupied areas with a Monozone™ Ultraviolet Air Ozone Generator is very effective. Air is drawn into the reflective treatment chamber through a washable particulate filter. This filter captures particles such as allergens and dust mites. Air then comes in contact with powerful UV-C rays and ozone from STER-L-RAY ® Ozone Producing Germicidal UV-C Lamps. These lamps emit germicidal ultraviolet rays at 254 nanometers—a wavelength that destroys the DNA structure of virtually all bacteria, virus, and mold. Influenza, strep, and hepatitis are just a few of the infections that can be eliminated. STER-L-RAY ® Ozone Lamps also produce ultraviolet rays at 185 nanometers—a level that emits ozone—to deodorize and clean the air. It can remove odors from cooking, smoke, and mold. Purified air then exits through the Louvered Exhaust Panel. *New Product Off-Gassing – Cars, RVs, Boat Interiors, Furniture, Carpeting, Fresh Paint, or Construction. There are 3 Monozone™ models available. Atlantic Ultraviolet’s UV Application Specialists are here to assist you in selecting the right model for your needs. Although all models feature the Louvered Exhaust Panel to prohibit ultraviolet from exiting the treatment chamber, exposure to concentrated ozone is dangerous. All applications must be unoccupied during Monozone™ treatment, and you must properly ventilate the area once disinfection is complete. Ultraviolet rays are powerful and can be harmful to skin and eyes if exposure occurs. Optional features give Monozone™ operators and your staff peace of mind. The SENTINEL™ Remote Lamp Indicator allows the operator to know from a safe distance that the lamps are hard at work. 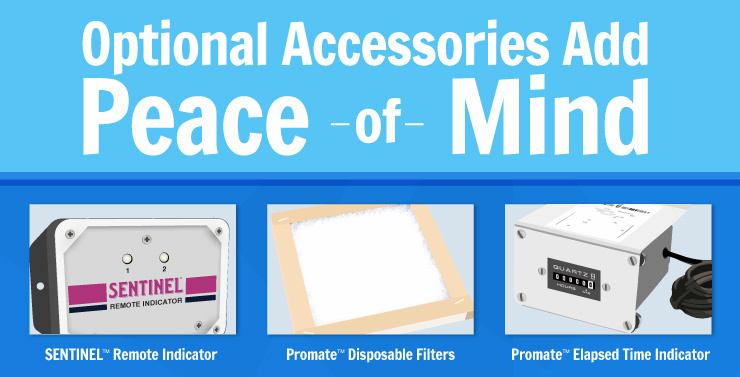 Promate™ Disposable Filters are available for applications that need frequent filter change and for when you don’t want to wash reusable filters. The Promate™ Integral Elapsed Time Indicator is a real-time, non-resettable display of accumulated operating time. It’s useful for scheduling and recording maintenance and lamp replacement. Atlantic Ultraviolet constructs its UV-C air and surface disinfection systems in the USA of the highest quality materials. Shop the Monozone™ at BuyUltraviolet.com. Made in the USA from U.S. and imported parts, the ultraviolet air and surface purifiers from Atlantic Ultraviolet Corporation® are constructed of the highest quality materials for ultimate durability. Our UV Application Specialists will help you decide which one is right for any particular residential, commercial, or industrial application.